Aww… so Kate Middleton went with the Cartier “halo” tiara as her “something borrowed” from the Queen. Really, what girl could resist wearing a halo on her wedding day, especially if you are to be wed in an ethereally decorated Westminster Abbey with trees on the inside? Was it me or did this make the shots of the gothic cathedral peaks appear to be the new sky? Veil – soft, ivory silk tulle with a trim of hand-embroidered flowers, embroidered by the Royal School of Needlework. Tiara – Cartier “halo” tiara, lent to Miss Middleton by The Queen. It was by Cartier in 1936 and was a gift from The Duke of York (later King George VI) to his Duchess (later Queen Elizabeth The Queen Mother) three weeks before he succeeded his brother as King. The Queen Mother passed it down to Princess Elizabeth (now The Queen) on her 18th birthday. Only Jewels has done a great post on other royals wearing the Cartier “halo” tiara. Dare I say that Kate wore it best? 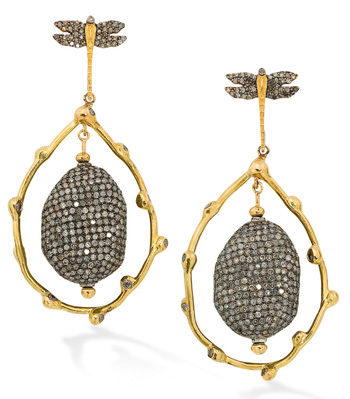 Earrings – diamond-set stylised oak leaves with a pear shaped diamond set drop and a pavé set diamond acorn suspended in the center by Robinson Pelham. It was inspired by the Middleton family’s new coat of arms and to pair well with the tiara. They were a wedding gift from her parents. 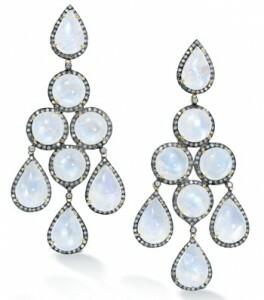 Earrings – floral diamond earrings from Robinson Pelham. 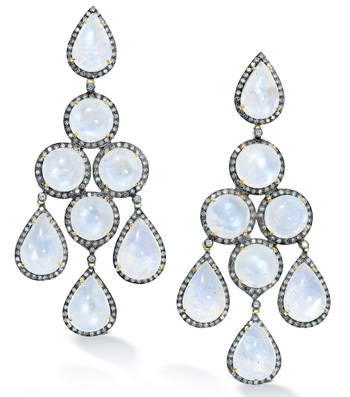 Clearly the royal wedding was a huge day for Robinson Pelham Jewellery, a boutique jeweler in London. They did a fabulous job complimenting Sarah Burton’s Alexander McQueen dresses. See the whole Robinson Pelham earring gallery. This entry was posted in Fine Dining. Bookmark the permalink.